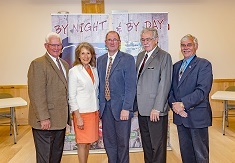 Wellsboro, PA – On Thursday, June 29, community leaders and travel professionals from Potter and Tioga Counties announced the merger of their respective tourism marketing and promotion organizations. The kickoff event for the new VISIT POTTER TIOGA organization was held at the Pennsylvania Lumber Museum in Galeton, PA. Representatives from state and local government, county commissioners, state and local tourism officials, and board members in attendance showed their dedication and support for the $247 million tourism business in the combined area. Visit Potter Tioga will highlight the incredible variety of world class travel destinations in the region including the Pennsylvania Grand Canyon, Cherry Springs Dark Skies, Tioga-Hammond & Cowanesque Lakes, Lyman Run, the Pennsylvania Lumber Museum, the Pine Creek Rail Trail, the Coudersport Ice Mine, and others. A luncheon was held at The Old Antlers Inn following the announcement where attendees had the opportunity to view the new website, www.visitpottertioga.com. The new site allows travelers to check out hotel availability in real time, explore the various shopping, dining and touring attractions in the region and will provide a current events calendar and member news. More announcements and events will roll out in the coming weeks to introduce members and the public to the benefits and services that Visit Potter Tioga offers to the region.